Welcome to Mega Yacht Rentals Europe and Italian Riviera Mega Yacht Rentals. Here you can find it all - culture, history, beauty, cuisine, peaceful bays, secluded islands, fantastic ports and nightlife. Mediterranean destinations have so much to offer in relaxed atmosphere. 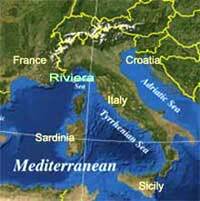 Italian Riviera is somehow less developed than the French Riviera, many feel the Ligurian Coast/Italian Riviera is as good or even better a charter destination than its more famous neighbor. You can find it all on a charter in Italy - culture, history, beauty, cuisine, peaceful bays, secluded islands, fantastic ports and nightlife. We highly recommend Italy because it`s has as much to offer as any Mediterranean destination, but is often less crowded and more relaxed. Italy offers world class charter destinations including Sicily, Porto Cervo, Sardinia, Naples, Portofino & the Italian Riviera, Capri, Positano, Rome and the Amalfi Coast. We have hundreds of boats and yachts throughout Italy for you - from Super Yachts to bareboats, to day charters. So please sort through our boats and let us know which ones are of interest, and we`ll take it from there!